Download "HELEN BADER INSTITUTE FOR NONPROFIT MANAGEMENT"
2 policy decisions remain to be made with regard to how it will be sponsored, governed, and supported within the university, this program too could begin the necessary round of approvals during the fall of 2002 or the spring of It is conceivable that this new masters degree program could be launched as early as the fall semester of 2003 if an already approved degree program structure at the university is utilized as the vehicle for obtaining final faculty approvals for this new program. However, if a decision is made to seek approval for an entirely new degree on the UWM campus and in the UW system, the launch of this new program would not likely occur before the fall of The Helen Bader Institute has obtained funding from the Greater Milwaukee Foundation to underwrite the costs of developing up to ten new graduate-level courses in nonprofit management and leadership that would form the basis of both the new graduate certificate and masters degree programs in nonprofit management and leadership. However, additional financial resources will need to be secured from a combination of tuition revenues and other earned income as well as from philanthropic gifts and grants to support the ongoing instructional and other costs associated with offering these new courses and sustaining these new educational programs over the long run. Noncredit Educational Programs Noncredit Professional Certificate in Nonprofit Management Implementation is underway for the non-credit Professional Certificate in Nonprofit Management program being offered by the School of Continuing Education (formerly University Outreach) and the Helen Bader Institute for Nonprofit Management at UWM. This certificate program is designed for people who are committed to careers in nonprofit management and who, for whatever reason, do not seek a master's degree or graduate-level certificate. 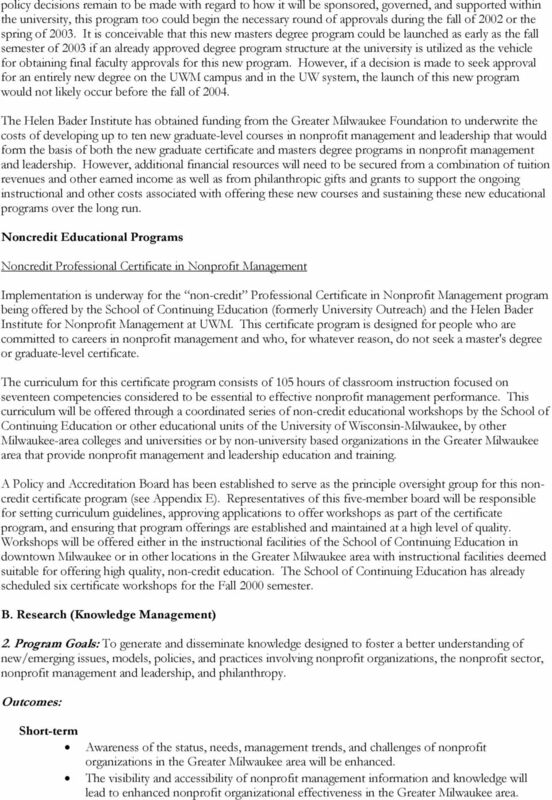 The curriculum for this certificate program consists of 105 hours of classroom instruction focused on seventeen competencies considered to be essential to effective nonprofit management performance. 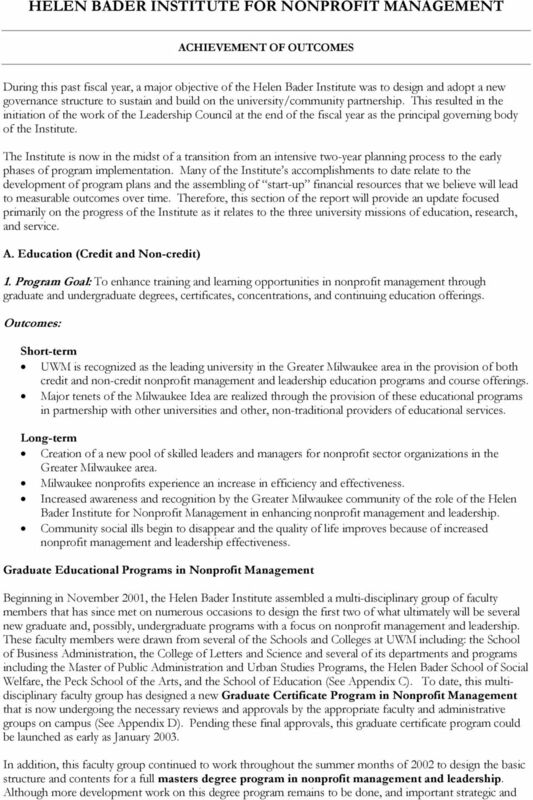 This curriculum will be offered through a coordinated series of non-credit educational workshops by the School of Continuing Education or other educational units of the University of Wisconsin-Milwaukee, by other Milwaukee-area colleges and universities or by non-university based organizations in the Greater Milwaukee area that provide nonprofit management and leadership education and training. A Policy and Accreditation Board has been established to serve as the principle oversight group for this noncredit certificate program (see Appendix E). Representatives of this five-member board will be responsible for setting curriculum guidelines, approving applications to offer workshops as part of the certificate program, and ensuring that program offerings are established and maintained at a high level of quality. Workshops will be offered either in the instructional facilities of the School of Continuing Education in downtown Milwaukee or in other locations in the Greater Milwaukee area with instructional facilities deemed suitable for offering high quality, non-credit education. The School of Continuing Education has already scheduled six certificate workshops for the Fall 2000 semester. B. Research (Knowledge Management) 2. Program Goals: To generate and disseminate knowledge designed to foster a better understanding of new/emerging issues, models, policies, and practices involving nonprofit organizations, the nonprofit sector, nonprofit management and leadership, and philanthropy. Awareness of the status, needs, management trends, and challenges of nonprofit organizations in the Greater Milwaukee area will be enhanced. The visibility and accessibility of nonprofit management information and knowledge will lead to enhanced nonprofit organizational effectiveness in the Greater Milwaukee area. 3 Long-term Milwaukee becomes a prominent contributor to the growing body of knowledge regarding nonprofit organizations, the nonprofit sector, nonprofit management and leadership, and philanthropy. Research Projects The Helen Bader Institute for Nonprofit Management has joined with the Donor s Forum of Wisconsin and the Center for Urban Initiatives and Research (CUIR) at UWM as joint sponsors of a special study of the Economic Impact of Nonprofit Organizations in the State of Wisconsin. The results of this study will be available in the fall of In addition, CUIR, with the support of the Helen Bader Institute will begin in the fall of 2002 a series of complementary studies that together with the economic impact study will describe the State of the Nonprofit Sector in Milwaukee. The first of these studies an examination of the social entrepreneurship activities in the Greater Milwaukee area is now underway. Other knowledge management projects to be initiated in coming months are: Applied research projects on selected topics of interest to nonprofit managers and leaders A small grants program to encourage new collaborative research by scholars and nonprofit practitioners. C. Service (Nonprofit Organizational Capacity Building) 3. Program Goal: To enhance the organizational effectiveness of nonprofit organizations in the Greater Milwaukee area. Providers of management assistance services to nonprofit organizations in the Greater Milwaukee area become more effective The pool of consultants of color providing management support services and the utilization of these consultants of color in the provision of such services are increased. Long-term The capacity of nonprofit organizations in the Greater Milwaukee area to pursue their missions effectively is increased. 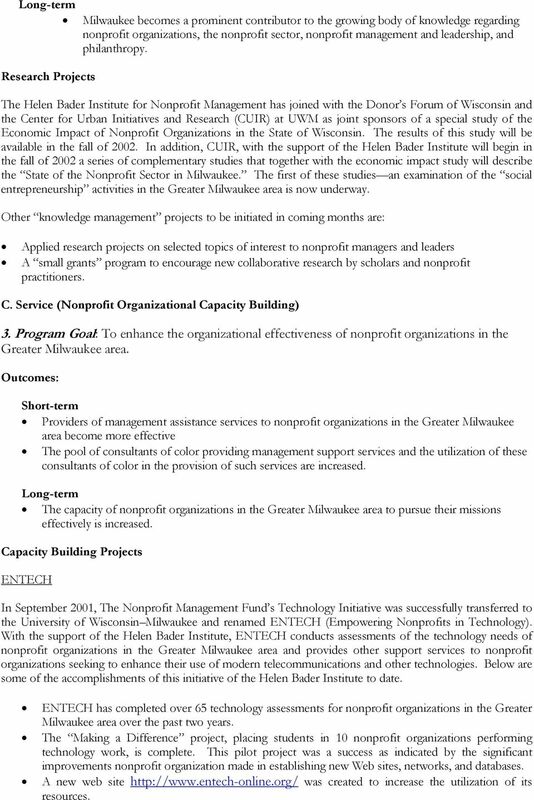 Capacity Building Projects ENTECH In September 2001, The Nonprofit Management Fund s Technology Initiative was successfully transferred to the University of Wisconsin Milwaukee and renamed ENTECH (Empowering Nonprofits in Technology). With the support of the Helen Bader Institute, ENTECH conducts assessments of the technology needs of nonprofit organizations in the Greater Milwaukee area and provides other support services to nonprofit organizations seeking to enhance their use of modern telecommunications and other technologies. Below are some of the accomplishments of this initiative of the Helen Bader Institute to date. ENTECH has completed over 65 technology assessments for nonprofit organizations in the Greater Milwaukee area over the past two years. The Making a Difference project, placing students in 10 nonprofit organizations performing technology work, is complete. This pilot project was a success as indicated by the significant improvements nonprofit organization made in establishing new Web sites, networks, and databases. A new web site was created to increase the utilization of its resources. 4 A Strategic Planning Team was established to provide advice on future directions and support. Nonprofit Milwaukee Portal The Nonprofit Milwaukee Portal was initially developed by representatives of a group of Milwaukee area providers of management support services with the support of the Helen Bader Institute for Nonprofit Management. Its purpose is to increase the availability and accessibility of information regarding events and other matters of interest to nonprofit organizations in the Greater Milwaukee area. The Portal is now on-line at and its calendar of nonprofit activities in the Greater Milwaukee area will be significantly expanded this coming year. The Portal will also provide access to reports and other publications of interest to local nonprofits. Links to information on certain hot topic areas, such as social entrepreneurship and nonprofit strategic alliances will also be added. The Portal is now averaging over 500 hits per month by a variety of users. The Consultants of Color and Standards and Ethics Projects During the past year, the Helen Bader Institute agreed to carry out two new projects designed to enhance capacity building services for nonprofit organizations in the Greater Milwaukee area. 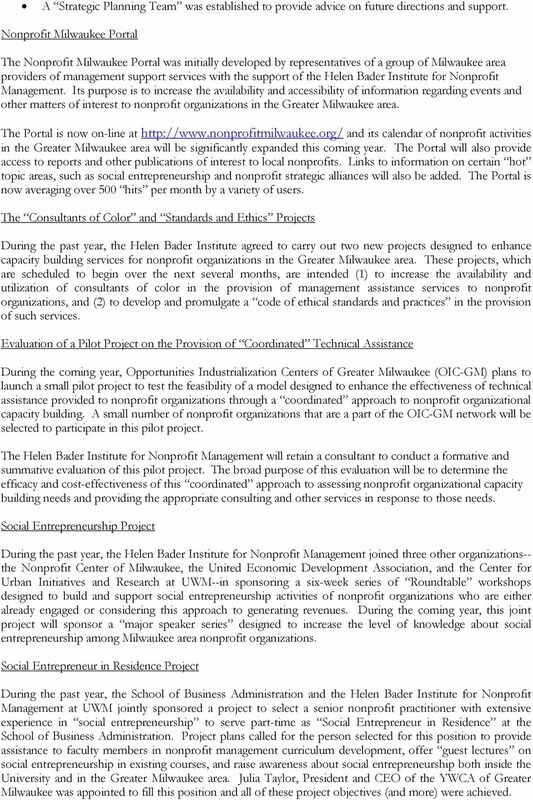 These projects, which are scheduled to begin over the next several months, are intended (1) to increase the availability and utilization of consultants of color in the provision of management assistance services to nonprofit organizations, and (2) to develop and promulgate a code of ethical standards and practices in the provision of such services. Evaluation of a Pilot Project on the Provision of Coordinated Technical Assistance During the coming year, Opportunities Industrialization Centers of Greater Milwaukee (OIC-GM) plans to launch a small pilot project to test the feasibility of a model designed to enhance the effectiveness of technical assistance provided to nonprofit organizations through a coordinated approach to nonprofit organizational capacity building. A small number of nonprofit organizations that are a part of the OIC-GM network will be selected to participate in this pilot project. The Helen Bader Institute for Nonprofit Management will retain a consultant to conduct a formative and summative evaluation of this pilot project. The broad purpose of this evaluation will be to determine the efficacy and cost-effectiveness of this coordinated approach to assessing nonprofit organizational capacity building needs and providing the appropriate consulting and other services in response to those needs. Social Entrepreneurship Project During the past year, the Helen Bader Institute for Nonprofit Management joined three other organizations-- the Nonprofit Center of Milwaukee, the United Economic Development Association, and the Center for Urban Initiatives and Research at UWM--in sponsoring a six-week series of Roundtable workshops designed to build and support social entrepreneurship activities of nonprofit organizations who are either already engaged or considering this approach to generating revenues. During the coming year, this joint project will sponsor a major speaker series designed to increase the level of knowledge about social entrepreneurship among Milwaukee area nonprofit organizations. Social Entrepreneur in Residence Project During the past year, the School of Business Administration and the Helen Bader Institute for Nonprofit Management at UWM jointly sponsored a project to select a senior nonprofit practitioner with extensive experience in social entrepreneurship to serve part-time as Social Entrepreneur in Residence at the School of Business Administration. Project plans called for the person selected for this position to provide assistance to faculty members in nonprofit management curriculum development, offer guest lectures on social entrepreneurship in existing courses, and raise awareness about social entrepreneurship both inside the University and in the Greater Milwaukee area. Julia Taylor, President and CEO of the YWCA of Greater Milwaukee was appointed to fill this position and all of these project objectives (and more) were achieved. 5 As a direct result of this project, plans are now being finalized for a meeting to be held at Wingspread in early October 2002 to explore the feasibility of establishing a social venture partners group to increase the pool of funds available for investment in Milwaukee-area social enterprises. Nonprofit Excellence Awards Luncheon The Helen Bader Institute and the Nonprofit Center of Milwaukee have jointly submitted a proposal (in response to an invitation by the Board of Directors of the Greater Milwaukee Nonprofit Institute) to assume the management and fiscal responsibility for the Milwaukee Area Nonprofit Excellence Award Luncheon beginning in The purpose of this awards luncheon, which was first held in 2002, is to recognize and celebrate the contributions of outstanding nonprofit organizations in the Greater Milwaukee area. Sponsorship of this event should raise the visibility of the Helen Bader Institute and its co-sponsoring organizations in the Milwaukee area and generate revenues that can be used to provide scholarship support for students in the educational programs of the Helen Bader Institute. Supporting Activities During the past year, the Helen Bader Institute has provided staff and other support to a number of projects and activities being spearheaded by other Milwaukee area organizations to enhance the capacity of nonprofit organizations. 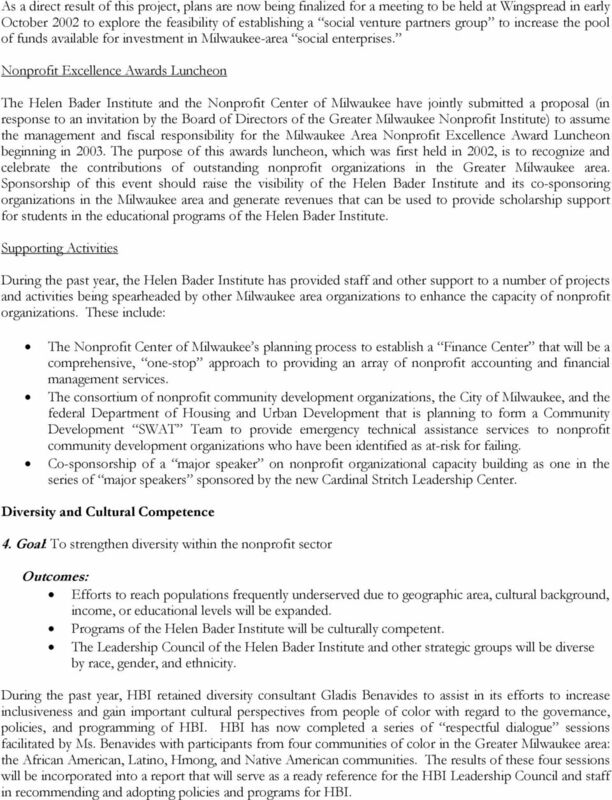 These include: The Nonprofit Center of Milwaukee s planning process to establish a Finance Center that will be a comprehensive, one-stop approach to providing an array of nonprofit accounting and financial management services. The consortium of nonprofit community development organizations, the City of Milwaukee, and the federal Department of Housing and Urban Development that is planning to form a Community Development SWAT Team to provide emergency technical assistance services to nonprofit community development organizations who have been identified as at-risk for failing. Co-sponsorship of a major speaker on nonprofit organizational capacity building as one in the series of major speakers sponsored by the new Cardinal Stritch Leadership Center. Diversity and Cultural Competence 4. Goal: To strengthen diversity within the nonprofit sector Efforts to reach populations frequently underserved due to geographic area, cultural background, income, or educational levels will be expanded. Programs of the Helen Bader Institute will be culturally competent. The Leadership Council of the Helen Bader Institute and other strategic groups will be diverse by race, gender, and ethnicity. During the past year, HBI retained diversity consultant Gladis Benavides to assist in its efforts to increase inclusiveness and gain important cultural perspectives from people of color with regard to the governance, policies, and programming of HBI. HBI has now completed a series of respectful dialogue sessions facilitated by Ms. Benavides with participants from four communities of color in the Greater Milwaukee area: the African American, Latino, Hmong, and Native American communities. The results of these four sessions will be incorporated into a report that will serve as a ready reference for the HBI Leadership Council and staff in recommending and adopting policies and programs for HBI. 1. Urban Teacher Education ($1,448,300) UWM's preparation of urban teachers will double, by 2006, in the areas of greatest need: early childhood, bilingual education, special education and science education.